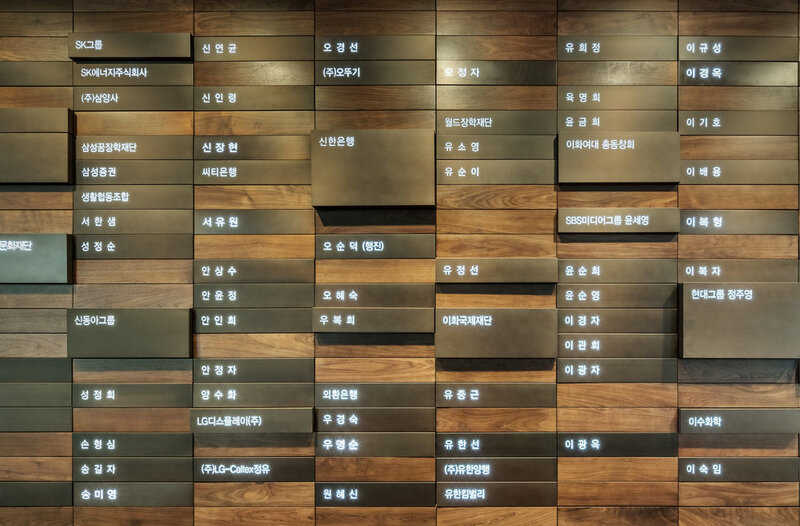 Ewha Donor's Wall is located at Ewha Campus Complex(ECC) in Seoul. The wall was constructed as one of the series of events for Ewha Womans University’s 127th anniversary in order to pay honor and gratitude to the donors. On the wall, 221 significant donors’ names were inscribed on wooden blocks, each name backlit with subdued LED. Six hundred more blocks for the future donors are reserved. On the digital panels, all donors’ names are presented. Donation on the spot by touching the control monitor is enabled. Through the touch screen, visitors can search the donation history of Ewha, list of donors, and the interview videos of prominent donors.